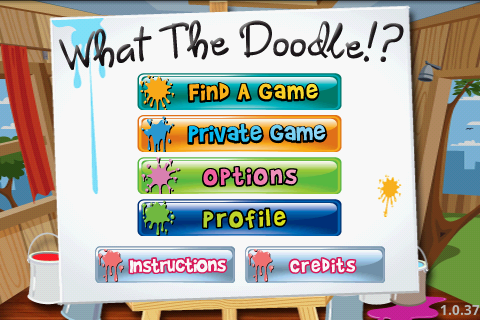 If you have ever played Pictionary you’ll be familiar with the concept of What the Doodle. 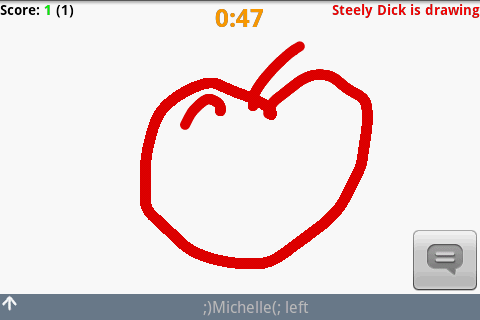 You are dropped in a room with four other people and you each get two turns drawing a phrase. Hilarity ensues when you have no idea what’s being drawn or no idea how to draw a phrase. So how does it work on Android? Well obviously it’s online and connects straight away to the other people playing, most people are using the free (lite) version which only supports easy difficulty but more and more people seem to be playing every day. Needless to say I have never had a problem getting into a game on easy mode. Could do with some more people to buy the full version, currently only £1 meaning there’s a few more modes to play for everyone. Buying also lets you draw your own avatar which people will see in the game. Drawing with the touch screen on my G1 was great, my finger wasn’t the most precise of drawing implements but it did the job perfectly well and I was surprised how easily people guessed some of my worse doodles. There are a few problems of course, with people writing when they can’t be bothered but there’s a system in place to boot players who cheat or who do not play in the spirit of the game. There’s also great stat tracking with details on your games played and overall points. The whole experience works smoothly and effortlessly even on my piddly G1, there are a few problems with other handsets and virtual keyboards as obviously it takes up some of the screen. I’ve never had a force close and can’t really fault the experience I’ve had. Connection wise it even seemed to work pretty well over 3G and never seemed to drop from a game at all. All in all it’s a great app and one of the most fun I’ve ever played on Android. With the free version having enough fun for most people and the paid version being a meager £1 I can only see more people playing and buying in the future. Hopefully I’ll contribute to that and get some people to play some of the advanced game types. QR code for lite version in the comments below.